Construction on Denbar began the first day I had Minecraft, in April 2012. The first structure I built was a small castle on an intense bit of mountain. It grew and grew and grew until it became what is now Cair Denbar, the home of the Emperor. What started as a small castle, is now a massive castle complex that spans three adjacent mountaintops. A small village that started north of the castle has now become my largest single build, Imperial City. It includes the Cair Denbar complex, a massive Cathedral, marketplace, harbor, and an ever-growing Skyport (my world has airships). 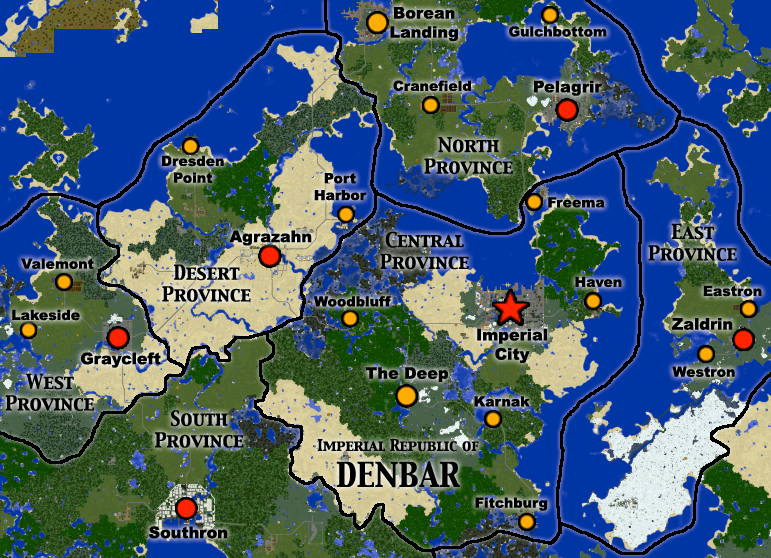 Originally Denbar started as a small Kingdom based around Cair Denbar, but it kept expanding. As I built more locations, I kept adding them in. Currently, the Imperial Republic of Denbar includes six Provinces, most of which began as kingdoms or city-states of their own, and slowly joined into the growing Empire. The Imperial Republic is ruled by a combination of an Emperor, and an Imperial Senate, made up of representatives from each City.